Award-winning beers on tap and in bottles, wine, full bar, handcrafted sodas, wood-fired pizzas, rotisserie chicken, salads, sandwiches, pasta, fresh seafood, steaks & dessert. In the past 20 years, Red Rock Brewery has earned a national reputation as one of the most creative breweries in the country. Our beers have earned more than 100 regional and national awards and our restaurant has been named ‘Brew Pub of the Year’ by Brewpub Magazine and ‘Large Brewpub of the Year’ by the Great American Beer Festival. Just off I-80 at the Kimball Junction exit, Red Rock Junction is located in the Redstone Center, amongst many fun family activities such as the Cold Stone Creamery or the Redstone Cinemas for a fun flick. It's the perfect spot to get away from the hustle and bustle of Park City's Main Street. Escape to Red Rock where you won’t break your budget or your spirits. Red Rock features a kid’s menu and fun coloring activities, so your family will always feel welcome. 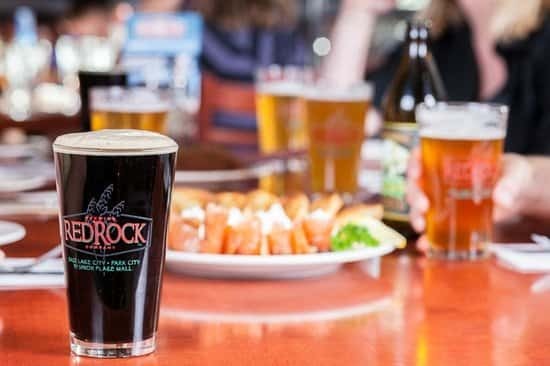 With award-winning brews, a full liquor and wine selection and a menu that boasts much more than your typical pub fare, you’re sure to find something for everyone at Red Rock!